As far as I'm concerned, I'm careful of food, I eat organic food. If you ask me, I like KFC's food and I don't take care of what I eat. In my wiew, a problem of delivery is not a scandal. From my point of view, this article is interesting because I don't know this organisation. If you ask me, I' dont understand this article. From my point of view, your article is great, I saw a similar article in TV. I would argue that it's damage that some KFC restaurants are closed to USA. As far as I'm concerned, because i love food and I think it's sad. 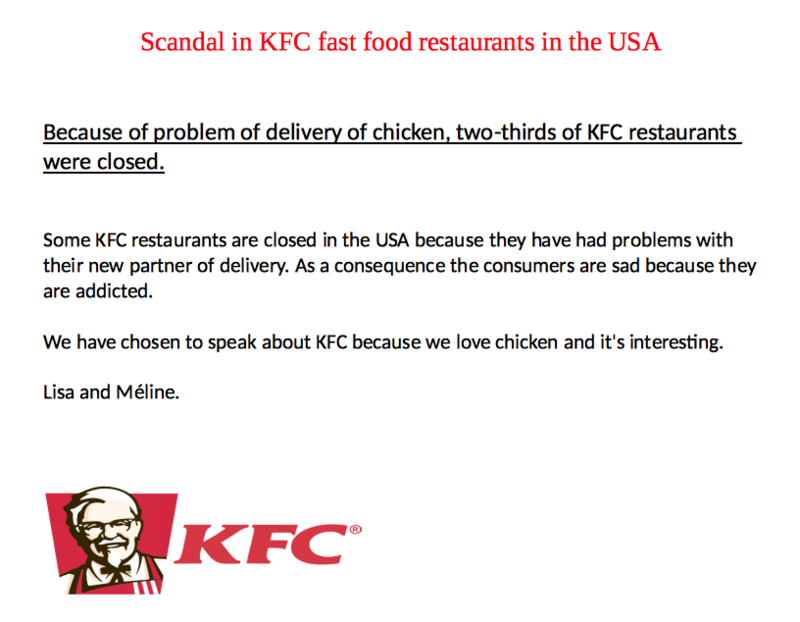 By my view, it's not realy grave because KFC is a big food chain so there arn't big consequence for them.